Malaysian Police Seize Cash, Jewels, Designer Bags From Ousted Premier's Residence : The Two-Way The pre-dawn raid on a condominium belonging to former Prime Minister Najib Razak, who was defeated in last week's elections, comes in connection with a long-running corruption scandal. Police prepare to load confiscated items into a truck in Kuala Lumpur, Malaysia on Friday after a raid on a condominium belonging to former Prime Minister Najib Razak. Barely a week after former Malaysian Prime Minister Najib Razak was defeated in elections, police carried out a pre-dawn raid at one of his residences, confiscating dozens of suitcases containing cash, jewelry and hundreds of designer bags as part of an ongoing corruption probe. 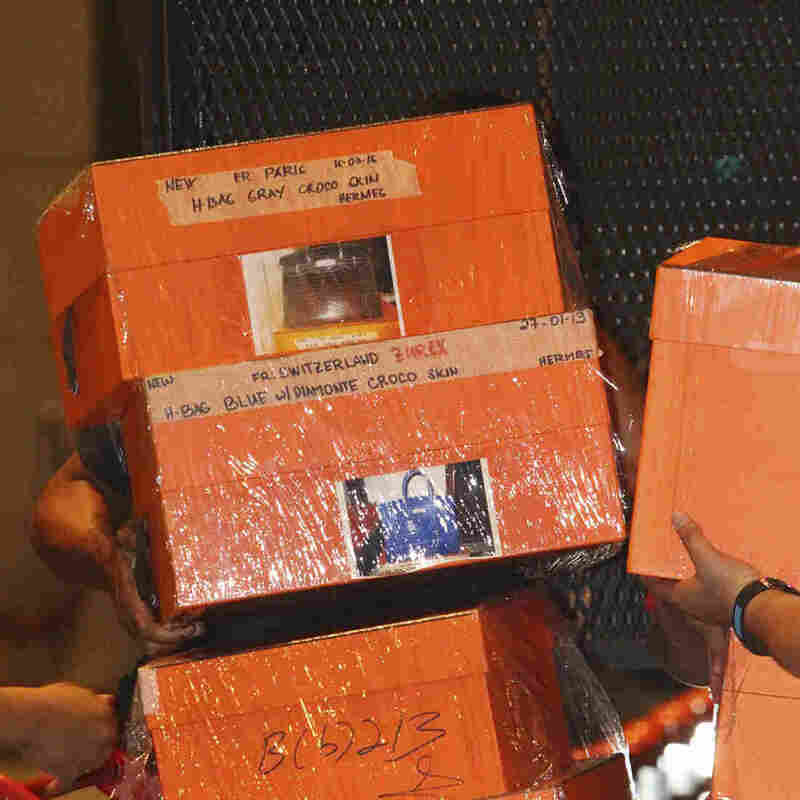 The Associated Press reports that Malaysian television "showed police carting away orange boxes containing handbags and luggage of various sizes from the condominium. Each orange box has a label and a picture of the bag." It said the labels on the boxes "describe the bags as a 'navy blue crocodile skin with diamond,' a 'blue with diamonte' crocodile skin Hermes and a gray crocodile skin Hermes. All appeared to be new and were bought abroad, including in Paris and Switzerland in 2013 and 2015." According to Fortune magazine the handbags come at a steep price, "The cost of new [Hermes] Birkins range from $12,000 to more than $200,000, and they regularly sell on the secondary market for more than their original sales price." Police prepare to load confiscated items, including designer Birken handbags and jewelry into a truck in Kuala Lumpur, Malaysia on Friday. "Exactly how much jewelry, I would not be able to say," Amar Singh, the director of police for commercial crime investigations, told reporters at the scene, according to Reuters. "We know that we confiscated bags containing jewellery and the [amount] of jewelry is rather big." Singh said the raid was in connection with the investigation into the 1Malaysia Development Berhad (1MDB) sovereign wealth fund. Later, the Malaysian Anti-Corruption Commission said it had found evidence of a suspicious $10.6 million transfer from a state fund to an account belonging to Najib, according to Reuters. It said Najib had been summoned to appear by the commission. Najib, whose defeat last week by 92-year-old former Prime Minister Mahathir Mohamad, came as a surprise upset, has been embroiled for years in the 1MDB scandal. The United States and five other countries, including Switzerland, are investigating claims that billions of dollars were siphoned off from the fund. Najib has denied all wrongdoing. "U.S. officials say a total of $3.5 billion, raised through bond offerings made by the investment fund 1MDB between 2009 and 2015, was laundered through a series of sham transactions and shell corporations by "high level officials" of the fund and their associates. The U.S. is seeking to reclaim only about $1 billion right now, because that's how much officials have been able to trace through the system. The money was allegedly used to purchase, among other things, artwork by Vincent Van Gogh and Claude Monet, a $35 million jet, high-end real estate and rights to the film The Wolf of Wall Street, U.S. officials said in a statement." Since then, U.S. investigators say the figure is closer to $4.5 billion, some of which ended up in Najib's bank account. The AP says $23 million of it was used to buy a pink diamond necklace for Najib's wife, Rosmah. Last year, the Justice Department filed a civil suit seeking nearly $30 million of funds stolen from 1MDB. According to the AP, "Police conducted simultaneous raids at several other locations including Najib's family house, his former office as prime minister and an official residence. Documents related to 1MDB were taken from the office and police are still trying to crack open a safe in Najib's house, [Singh] said.